inspired by Italian painting and cultural history of the 14th century. The player takes control of a 14th century Italian city state, striving for prosperity while battling over hegemony with a rival state. The game is over if one of the princes is killed in battle or one state is bankrupt and can be pocketed by the other. The two-player game is inspired by large-scale 4X strategy classics, but breaks them down to a more dynamic and casual game format. Also bringing in deck-building mechanics of collectible card games, Magical Renaissance blends much-loved strategy genres into a unique mixture. 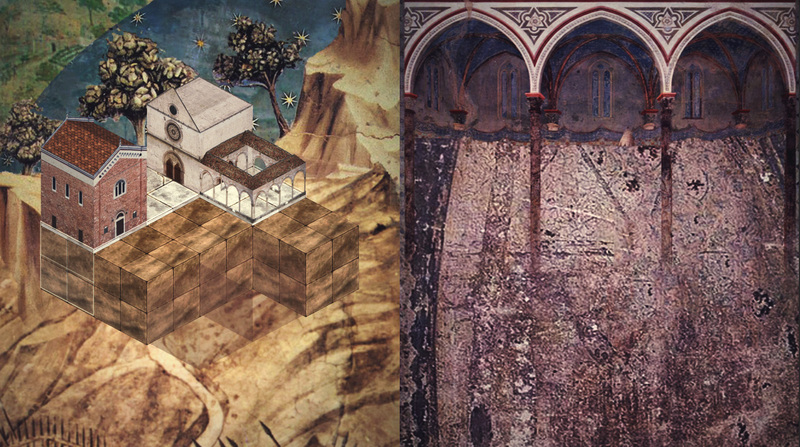 Unlike many other takes on a medieval game setting, Magical Renaissance focuses greatly on the authentic yet playful representation of a specific period in the history of art: The quiescent late medieval aesthetics of the Italian Trecento. All textures, 2D sprites and citizen portraits are assembled and composed from major works of art e.g. by Giotto di Bondone or the Sienese painter school. I want to pay homage to a fascinating era in cultural history by maintaining the richly textured and painterly feel of the originals. 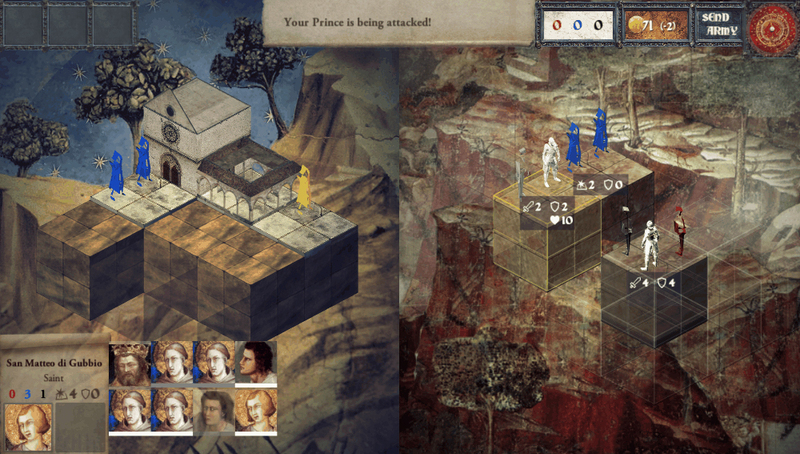 Magical Renaissance reduces the isometric worlds of the 4X genre to two 3×3 boards per player. 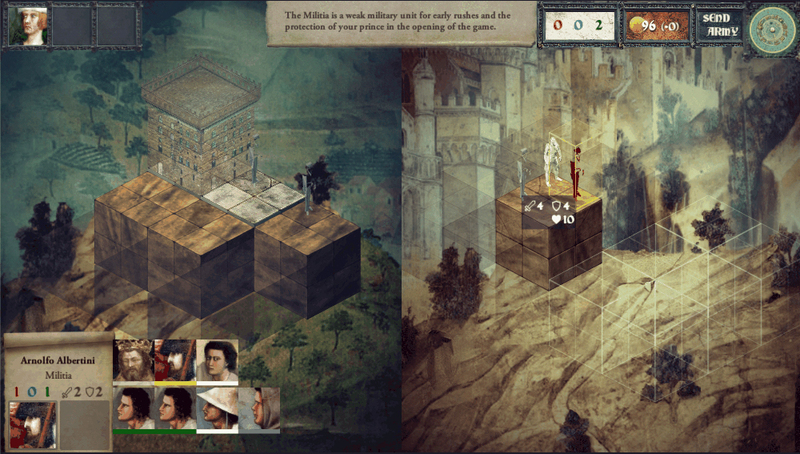 Citizens are delegated to either work in the city (left screen), where they create wealth, material and cultural goods, or serve in the army (right screen), where they protect their prince and fend off enemy forces, marauders and feral wildlife. 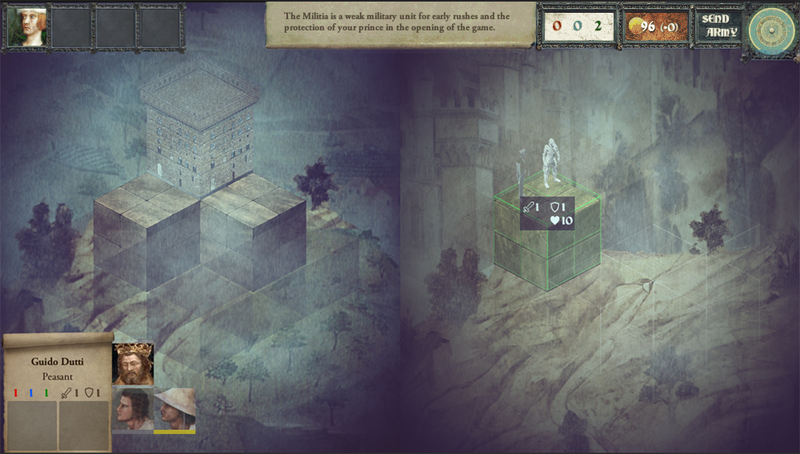 City development and the obligatory technology tree of the 4X genre are replaced by a novel feature in which the player selects his production options before the match, similar to the deck-building mechanics of collectible card games. Each building has distinct functions, creating a great number of combinations for build orders, strategies and activity curves. 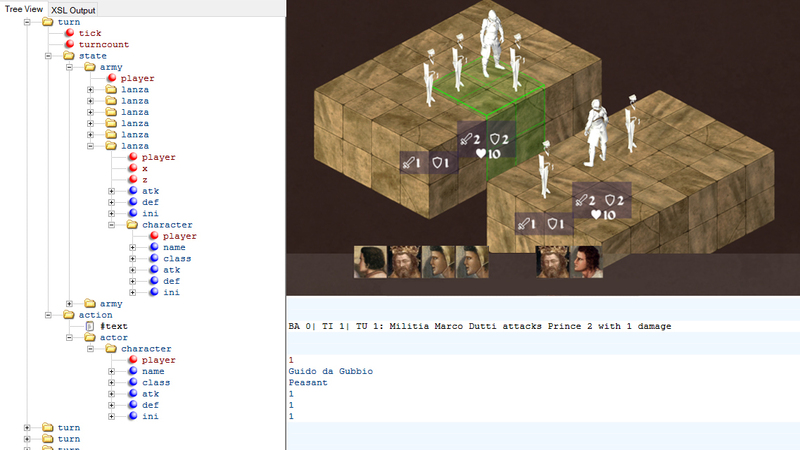 For fine-tuning the game rules and balance, I am working on a testing platform, where skirmishes can easily be orchestrated and reproduced on a large scale. 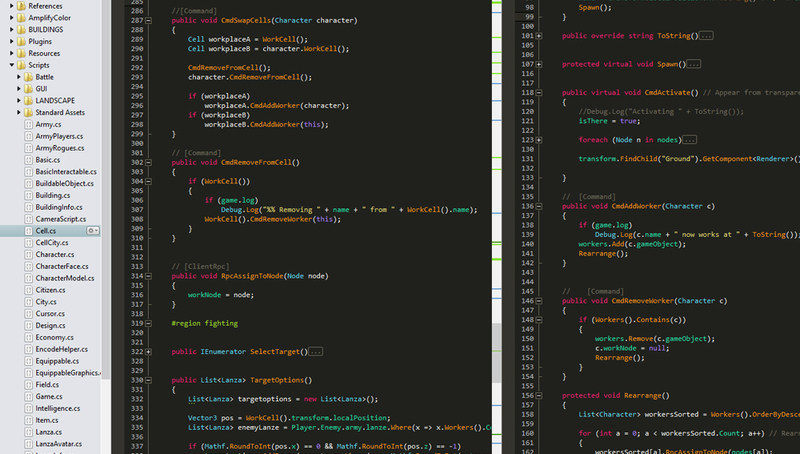 Battle results are exported to XML files, enabling further potential for statistical analysis. I envision an AI system in which the battle is “forked” over an AI decision, the branches played through to a certain extent, enabling the computer to decide on the move with the most favorable outcome. All programming is done in the C# programming language using the Unity3D development platform. In 2016, I presented my idea and an interactive prototype at Talk & Play #17 hosted by BerlinGameScene.com.